"A nice change from lemon meringue. A unique flavor." Preheat oven to 400 degrees F (205 degrees C). Line pastry with aluminum foil and a layer of pie weights or dried beans. Bake in the preheated oven until edge of crust is golden, about 10 minutes. Carefully remove the foil and weights; bake about 5 minutes more. In a small saucepan, stir together the 3/4 cup sugar, 1/3 cup cornstarch, and salt. Mix in the orange juice, lemon juice, and water. Whisk in the egg yolks. Cook over medium heat, stirring frequently, until thick and bubbly, about 5 minutes. Remove from heat, and stir in butter and orange zest. If desired; stir in diced orange segments. Pour into prepared pie crust, cover with plastic wrap, and set aside to cool. When pie filling has cooled to room temperature, preheat oven and prepare meringue. Preheat oven to 350 degrees F (175 degrees C). In a large glass or metal bowl, beat egg whites until foamy. Gradually add 1/2 cup sugar and cream of tartar, continuing to beat until stiff peaks form. Lift your beater or whisk straight up: the egg whites should form a sharp peak that holds its shape. 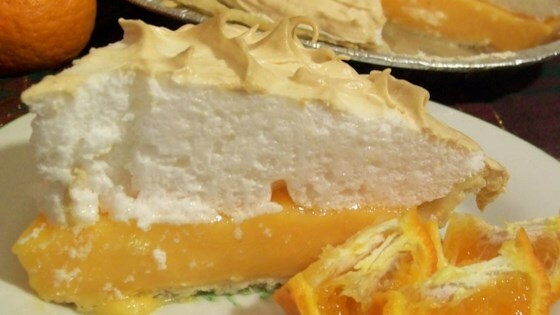 Spread over pie, making sure the meringue completely covers the filling and meets the edges of the pie crust. Bake in preheated oven until meringue topping is golden brown, about 15 minutes. Made this for a potluck. It was one of the first desserts to go. Everyone loved it. Very fresh and different without being too way out there or weird.